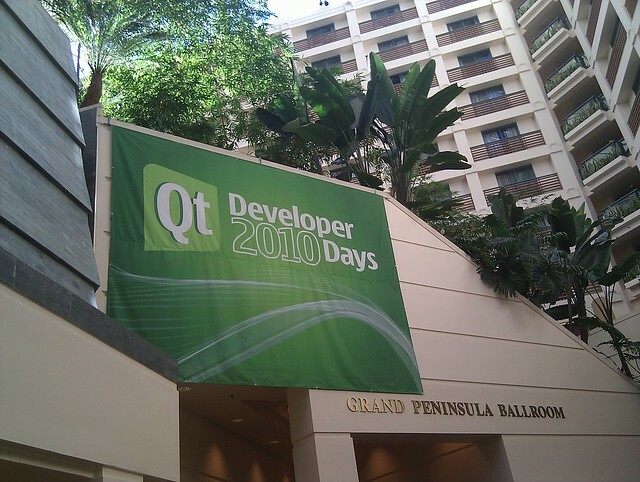 Since coming back from Qt Developer Days 2010 in San Francisco (more precisely in Burlingame, near SF airport), one thought really bothered my mind: "when will Qt become ubiquitous?". Now, if you are active in the KDE and Qt community, this seems like a strange question. But ubiquitous means omnipresence, in particular for the whole developer community. Flash back to ages ago. You wrote a cool Python script (could be also in Ruby, or Lua, pick your battle) to do FooBar, everyone you know was impressed, you wanted to share the love with the world and then some fellow hacker noticed, "That's cool, man. But I don't want to install Python, can you give me the executable?". What would you think? The situation is similar with Qt these days. You write a nice Qt-based utility, running on different platforms, somebody spots it and the first thing he asks is "Where is the binary? "; never mind he has just grabbed and installed hundreds MB worth of utilities. These days, when you are developing some software, the first thing you'd do on a fresh machine is to download and install a gazillion tools (Xcode with iOS SDK weighs around 3.8 GB). With the initiative towards open governance, I hope Nokia and others will be able to steward Qt in that direction: being included in the de-facto standard of development tool sets. The most interesting challenge is to overcome the doubt, "Why do I need to install some Nokia SDK to use your cool app?". You can easily build statically as a lot of projects do nowadays. Think Skype, VLC. However, when Qt is ubiquitous so you have about 10 Qt apps running on your desktop -- this does not make a lick of sense. You'll have the Qt libraries loaded in to RAM 10 times. It'd be good to have Qt installed on everyones machine. But when is it going to happen? Can't we have some redistributable like .NET has. It wouldn't be too big. Just include the shared libraries. Mainstream apps like VLC and Skype could include (and install) it for the users and then our apps won't have any troubles.